This article demonstrates how video can be played using DirectShow in C and C#. For more information on DirectShow, see MSDN. Demo project can be downloaded here. Goto My Device > Program Files > vcpp_video_playback_demo. Double click on the vcpp_video_playback_demo.exe to run the application. Following GUI will open with different controls (Single click on video or press Esc key to switch from full screen mode to normal mode). Go to My Device > Program Files > vcsharp_video_playback_demo and run the application vcsharp_video_playback_demo.exe. Following GUI will open with different controls (Double click on video to toggle between full screen mode and normal mode). Note: Microsoft does not provide a managed API for DirectShow. 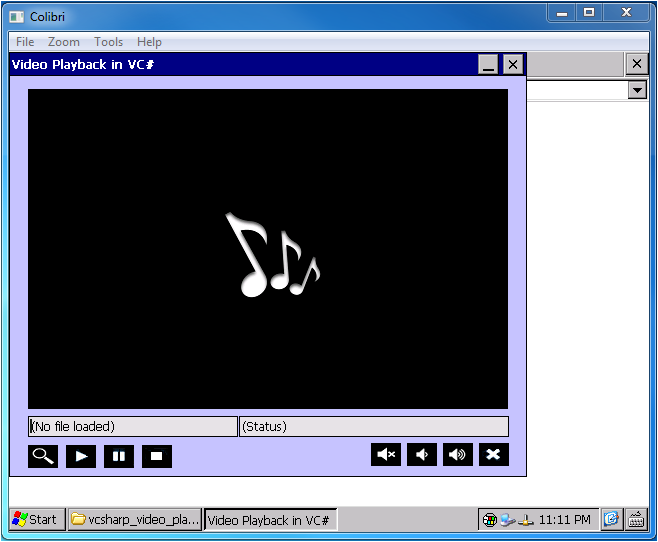 The vcsharp_video_plyback_demo uses DirectShow.net library functions from the 3rd party DirectShowLib-2005.dll. Documentation related to this library and its licence is given here. For the Colibri T20/T30 and Apalis T30 modules, the delay between the video stream and the audio stream can be adjusted to achieve synchronous playback. The default delay is 400ms.